There is No Zone Like The Ozone! What is the HOLE story about OZONE layer? 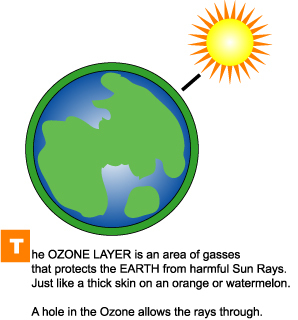 The ozone layer is a layer of ozone gas which surrounds the Earth some 15 to 35 km above its surface. This 20 km wide layer acts like a natural filter because it prevents most of the sun's ultraviolet rays from reaching the Earth. These rays could harm us if the ozone filter were not in place. For example, more people would get skin cancer and eye diseases. As well, animals would be affected and so would farmers' crops and the top layer of our oceans. So now you can see why it is very important to have this ozone layer around our planet and why a HOLE in the ozone can be a problem. What's the good and bad news about the Ozone Layer? This natural ozone layer accounts for about 90% of all the ozone gas that exists. As we have seen, it is very beneficial. 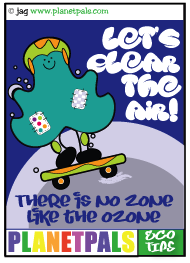 In fact, let us call it "good" ozone. The other 10% is "bad" ozone and comes from sources such as the exhaust from cars. But because this ozone is located down near the Earth' s surface, it gets trapped in the summer months in air pockets and causes smog over our cities. This type of air pollution has a bad effect on people who suffer from breathing problems. That's why we call it "bad" ozone and that's why many governments are working hard to get rid of it. You can learn a lot more about how you can help the planet ! 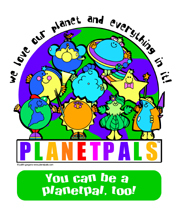 Planetpals: The most fun on earth!